Are you ready for one more fun Christmas cookie idea? 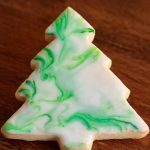 I was in the middle of rolling and cutting out my Easy Decorated Christmas Cookies when the inspiration for these Christmas Tree Shortbread Cookies came flitting through my brain. I was so excited that, right away, I had to pull out a Christmas tree cookie cutter and some green food coloring to give the idea a try. When I showed my swirly little trees to Scott, he loved them and thought each one was a work of art. I thought you might enjoy making (and giving) these easy cookies too! Buttery, delicious and clean crisp edges – a win, win, win! I searched for years for the perfect shortbread recipe. I wanted one that was not only buttery and melt-in-your-mouth delicious, but also one that would keep nice crisp edges when baked. I discarded one recipe after another until I discovered this one. Just the right proportion of butter, sugar and flour, as well as a small amount of cornstarch, are a few of the secrets to this delicious shortbread dough that keeps its shape in the oven. On top of tasting fantastic and exhibiting good behavior in the oven, this dough can be made in one bowl with no mixer. I dearly love my KitchenAid mixer but when I’m in a hurry, (almost always) it’s really nice to pull out just one bowl and a wooden spoon or sturdy spatula. Within minutes, my dough is mixed up and ready to roll! 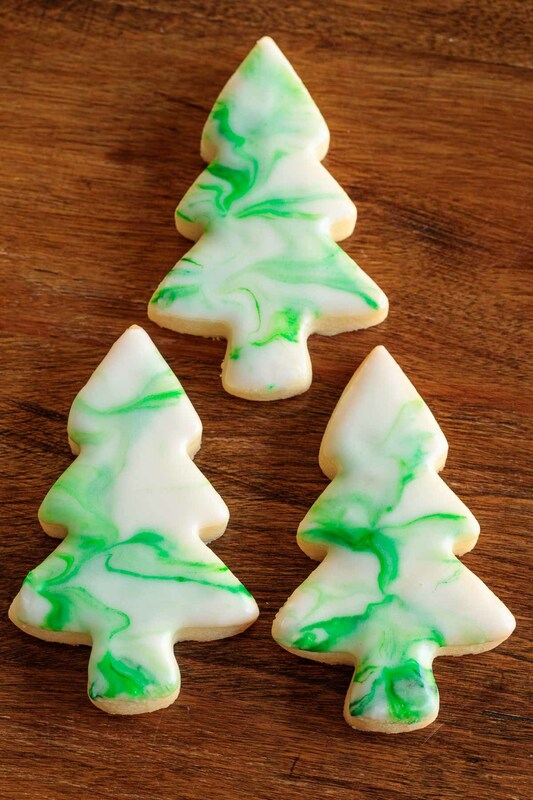 The technique for these Christmas Tree Shortbread Cookies is nothing new here at The Café. I’m not much of a fancy cake/cookie decorator. So when I discovered this easy method of making cookies look like they came from a fine bake shop, I was thrilled. 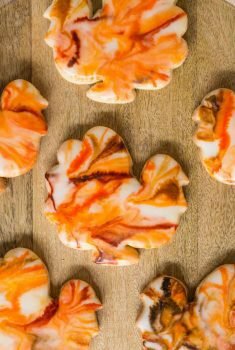 I call it my Dip, Drip and Flip technique and I’ve used it for several fun seasonal cookies, including these Glazed Shortbread Cutout Cookies, these Red, White and Blue Glazed Shortbread Cookies as well as my Easy Thanksgiving Shortbread Cookies. 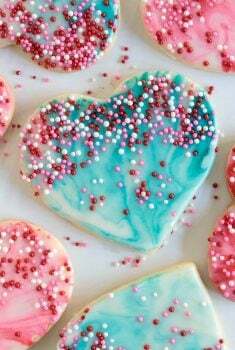 It’s a foolproof way to decorate beautiful cookies! How does it work? I thought you might want to see the technique in action, so I had Scott take a few shots while I iced these pretty Christmas Tree Shortbread Cookies. Check it out! You can see it’s pretty simple. Mix up a two-ingredient glaze then add your flavoring of choice. (I love to use peppermint extract at Christmas time, but lemon, almond, coconut and orange extracts are also delicious.) Next step is swirling a bit of green gel food coloring into the white glaze. 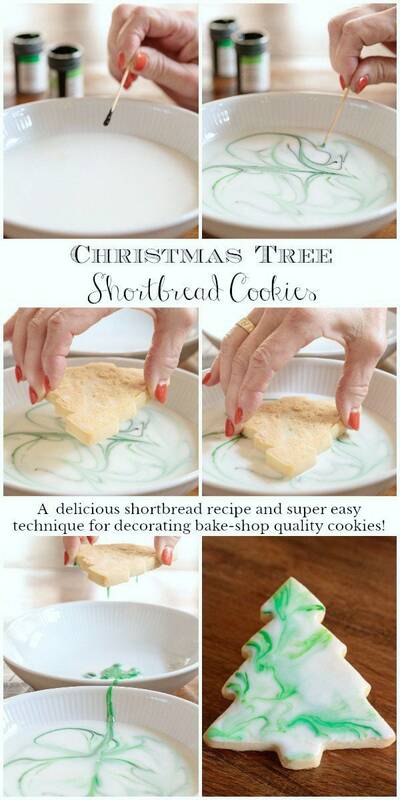 Hold one of the Christmas Tree Shortbread Cookies over the glaze and dip the top side to coat. Pull straight up and let the icing drip, then flip the cookie over and voila! Bakeshop quality that even a child can have success with! I thought I’d also share a video of this Dip, Drip and Flip decorating technique. It’s from my Red, White and Blue Glazed Shortbread Cookies but the technique is the same. So pull out a bowl – you have flour, butter, powdered sugar, milk (or half and half) and vanilla, right? That’s all you need, other than the green food coloring. But one more thing and this is essential! Find your favorite version of “O Tannenbaum” and be sure to have it playing while you mix, roll, cut out and bake. I had this wonderful version by the three tenors BLARING. I also love this rendition by Andrea Bocelli. 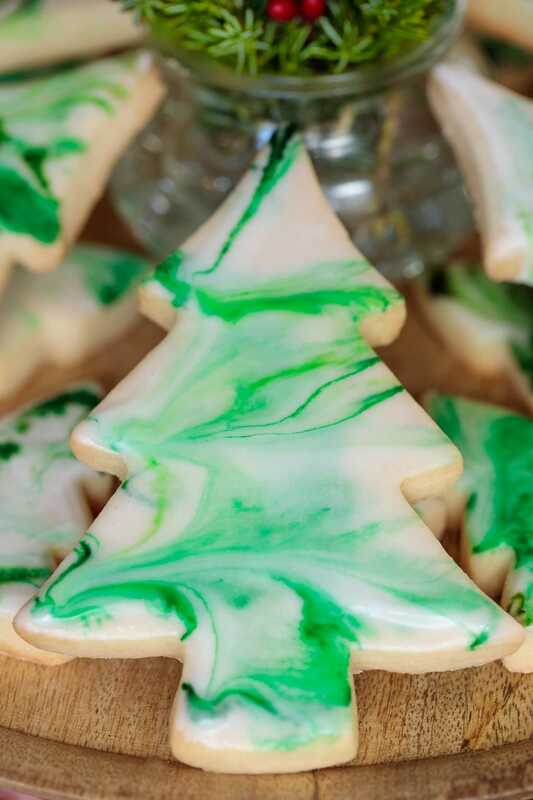 It will put you in the proper spirit to make these Christmas Tree Shortbread Cookies! Because there’s no mixer used, the butter needs to be very soft when mixing up these Christmas Shortbread Cookies. That can be difficult at this time of year, even if you let the butter sit out for hours. A short stint in the microwave on power level 10 (10%) works like magic to soften butter. You’ll need to experiment a bit with your microwave though, as they’re all different. Start with 20 or 30-second increments at power level 10 until you learn how long your microwave will take to get the butter nice and soft, but not melted. Another technique I often use to soften butter is to put it in the oven or microwave overnight with the light on. To keep the light on in the microwave I put a folded paper towel in the door. It works like a charm! I used Wilton’s Leaf Green and Kelly Green gel food colorings for my Christmas Tree Shortbread Cookies. Don’t roll these cookies too thin, otherwise, they will be difficult to dip into the glaze when decorating. I roll mine to a 3/8-inch thickness and use an adjustable rolling pin. How do you roll them to the desired thickness? 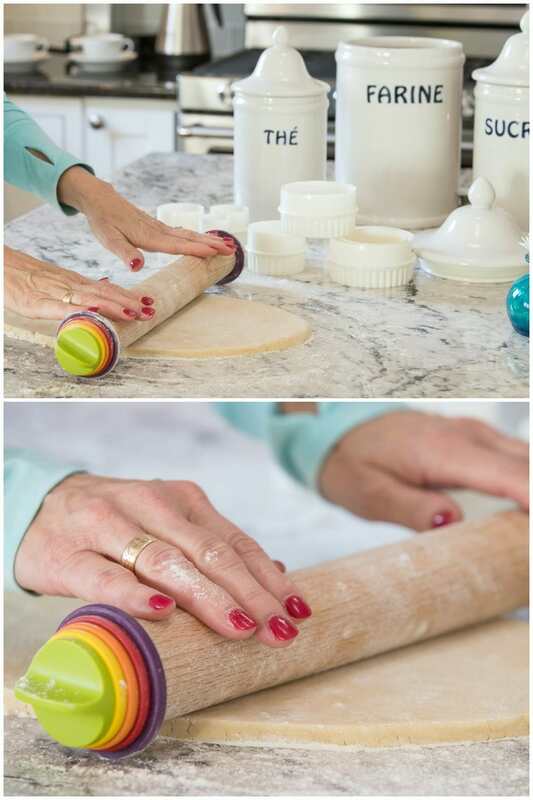 This reasonably priced rolling pin is a super easy way to achieve the same perfect thickness for all your cookies. It has 1/16, 1/6, 1/4, and 3/8-inch removable discs, making it easy to flatten your dough to a uniform thickness. Have a baker on your shopping list? This would make a lovely gift that can be used year round. You might even be the lucky recipient of some perfect, even Easy Decorated Christmas Cookies! I used peppermint extract in my glaze and buttercream. Feel free to use other flavorings. Almond, vanilla, orange, lemon and coconut extracts are also delicious. Flavor extracts can vary in intensity. It’s better to start with a small amount in the icing, then take a little taste. You can always add more, but you can’t remove it! The recipe calls for a one hour (or longer) chill for the cutout cookies. If I’m in a big hurry, I just pop them into the freezer for 10-15 minutes (don’t tell anyone I cheat!). Sometimes the glaze for these cookies will have lots of bubbles. These bubbles will cause imperfections in the surface of the glazed cookies. Simply stir the glaze very slowly to get rid of the bubbles. If you let the glazed cookies drip into the same bowl over and over the glaze will get murky before you’re finished icing all the cookies. Because of this, I like to let the glaze drip into a separate bowl. I used this set of Christmas tree cutters and this one. 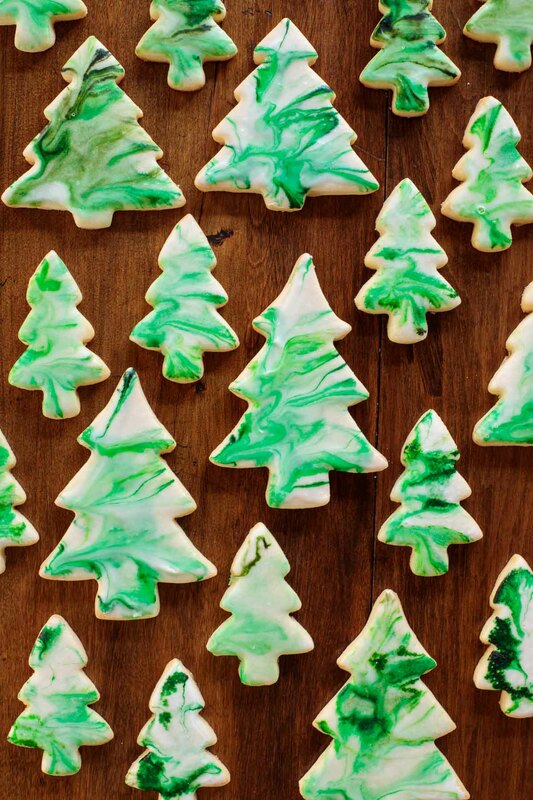 These one-bowl, no-mixer Christmas Tree Shortbread Cookies are not only delicious but the pretty decorating technique is super simple! Place soft butter in a medium-size mixing bowl. Stir with a wooden spoon or sturdy spatula until nice and smooth. Add powdered sugar and vanilla. Mix together by hand for about 30 seconds until well blended. Add the flour and cornstarch. Stir until dry ingredients are incorporated. The dough will be a little shaggy. Turn the dough out onto a lightly floured work surface and gather into a ball. Knead 5-6 times until fairly smooth and all the small pieces are worked in. Form into a ball again and flatten with your hand to form a flat disk. Turn the disk to coat both sides with flour. Roll out the dough to an approximate 3/8-inch thickness (see Café Tips above in the post). Keep work surface, dough and rolling pin lightly dusted with flour. Cut out Christmas trees (in one or more sizes) and transfer to prepared pans with a thin, metal spatula. Re-roll scraps as many times as needed to use up the dough. Place cutouts in the refrigerator for at least one hour or up to 24 hours. When ready to bake, preheat oven to 350˚F. Remove 1 pan of cutouts from the refrigerator and bake for 12-14 minutes, or until just beginning to turn golden at the edges. Rotate pans halfway through for even browning. Repeat with the second pan of cutouts. Combine powdered sugar, 4 tablespoons half and half (or milk), vanilla and peppermint extract in a medium-size bowl. Mix until smooth. The glaze should be fairly thick, but pourable. Add a little more half and half if too thick. Taste the glaze and add more extract, if a more intense flavor is desired. Transfer the glaze to a small shallow bowl (a little bigger than your cookies). 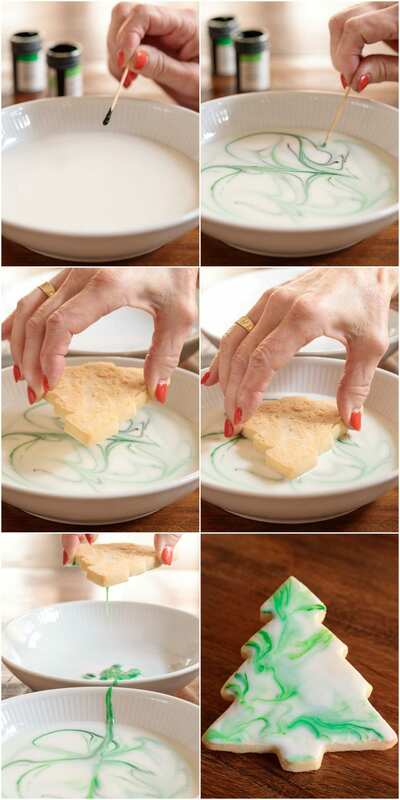 With a toothpick, swirl a small amount of two green gel food colorings through the icing in the bowl. Don’t swirl too much or the icing will become a solid color. Use a light hand with the gel food coloring. A little goes a long way! 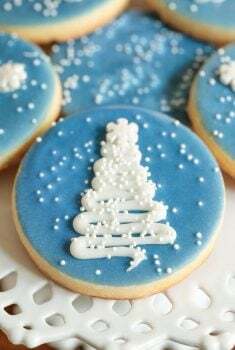 To glaze the cookies, hold onto the edge of a cookie and dip the top surface into the glaze, being sure all of the surface touches the glaze. Pull cookie straight up and out of the glaze. Allow excess glaze to drip into another bowl or plate (this will keep the glaze from getting murky) for about 30 seconds. When glaze stops dripping, quickly flip the cookie to the right side up and give it a gentle jiggle to allow the glaze to flow evenly over the surface. Repeat with remaining cookies. Place cookies on a cooling rack and allow glaze to dry completely. Makes 10-20 cookies, depending on the size of your cookie cutters. See Café Tips above in post for more detailed instructions and tips. I got my Christmas tree cookie cutters from Amazon. I made these last week and they were womderfu!. However once the icing dried it lost its sheen. They were dull. Why is that? Hmmm, not sure why that happened, Christina. Mine aren’t super shiny but they have a nice sheen once they’re dry. It’s such a fun technique Joyce. I will actually be posting a Valentine version today! Hi Nicole, if you let the cookies sit out for 12-24 hours, the icing will definitely harden enough to package them as you described! Enjoy! These came out great!! But I also tried to use red food coloring, and um… the result kind of looks like my cookies are covered in menstrual blood LOL so maybe everyone avoid red. Made these and took them to a Christmas potluck. You’re welcome Sandra, so happy you enjoyed them! ¡¡¡ Hola!!! Gracias por compartir. Lo voy a intentar y veamos cómo me queda. Una pregunta, qué quiere decir “4 cucharadas de mitad y mitad (o leche)”? Hola Maggy, mitad y mitad es un producto de conveniencia estadounidense que se usa a menudo en el café. Es una mezcla de media leche y media crema. Podrías usar leche entera en su lugar. I made the cookies yesterday and I love the no mixing recipe. I made one batch and thought well I need more so whipped up another. I seemed to need a lot of flour for rolling but once I got that adjusted was a breeze cutting them out. I did use a 1/4 inch disc on rolling pin by mistake! but just baked them a bit longer. One broke so I had to eat that one and cookies are really delicious – so light and tastes amazing. 5 stars for sure. So happy I used your recipe. Icing them this morning and only have the liquid green food coloring – will give that a try. Thanks Chris for this recipe. Have yourself a Merry Little Christmas! 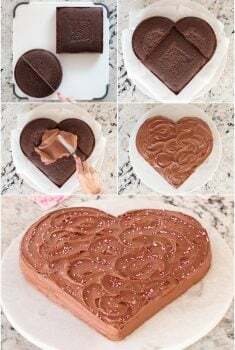 Have you ever tried more than one color in the icing or will they mix and get muddy? Hi there. Great recipe. Can these be frozen once glazed? Thx! Hi. Where you use 1/2 and1/2 in glaze, you you have to refrigerate after they harden? Hi Debbie, you just let them harden at room temperature. THeyre asking AFTER they dry. Once the icing isn’t dried is it ok having dairy (whether milk or half and half ) sitting out or do they need to be stored in the fridge? Thank you, Jackie, for being so kind as to clarify. Good question! No, the small amount of half and half (or milk) is stabilized by the large amount of sugar and considered safe at room temperature for two to three days. That’s why you see donuts and pastries with icing made with powdered sugar and milk sitting out at room temperature. They are so pretty! You are the expert with this technique, Chris! I makes decorating cookies so easy too. Love them you shared such a great idea. What a fun idea Chris, so cute!! My family wouldn’t allow me to give these away! So pretty!! Just Beautiful — cant wait to try them! Chris — What brand of extracts do you prefer and/or, for this one Do you have a favorite for peppermint ? So pretty and festive for the holiday season Chris! What beautiful gifts they would make too! The perfect holiday cookie! Love your easy technique for decorating. I’m going to try it one of these days 🙂 Pinning! They look amazing and festive! That glaze is really pretty, Chris.